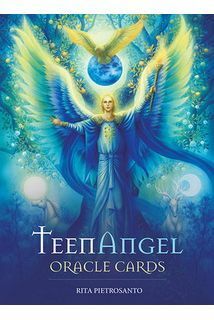 Rita Pieteosanto "Карты Teen Angel Oracle Cards"
"TeenAngel Oracle Cards" are designed for teenagers and young adults. Filled with vibrant and uplifting artwork, this deck offers support to help you navigate the curly challenges of growing up in our at-times-crazy world. It invites you to really get to know yourself and understand your feelings, and to reflect on your learning experiences and the obstacles that seem to stand in your way. It’s for times when you need help to get your head around a problem, when you’re freaking out before an exam, or when you just feel down, even if you don’t know why. You can think of the angels you’ll come across in these cards as your friends. They’re always here for you when you need some guidance. You’ll also benefit from the wisdom and experience of specialised teen counsellor, Rita Pietrosanto, who offers a bunch of really practical tools and exercises to help you feel like you’ve totally got this! Hardcover box set includes 40 cards and 100-page illustrated guidebook with messages and activities.